KUBERA or Kupera, Zambala, Jambalha, or Dzambalha is the Wealth Gathering deity. He brings wealth, happiness, and spirituality; and holds in his left hand, Nehulay which spews forth precious jewels from its mouth, while his right hand is holding gems shaped fruit and leaf of lotus. In Hindu circles he is more known as Kubera, and in Buddhist circles he is an emanation of Buddha Ratnasambhava. It's not unusual to see him painted with attributes of both Hinduism and Buddhism in play. Generally when painted with the jewel spitting mongoose in hand he is called Kubera or Kupera, and without the mongoose he is Zambala etc. If your having money issues or need more prosperity, happiness, fortune in your life, maybe changing the energy in your office or treatment space is what is in order. 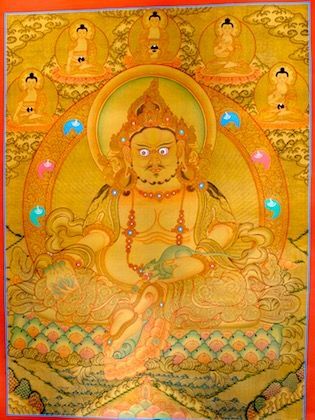 This thangka is not brocaded. Email for pricing and details. WHITE TARA - born from a tear of Avalokiteswara. She is believed to protect human beings while they cross the Ocean of Existence. She is seated in the full vajra posture. Her right hand is in the 'boon confering' posture, and her left hand holds the stem of the lotus. 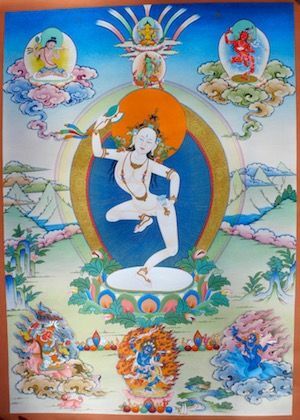 White Tara is believed to prolong life and is associated with healing practices. Gautama Buddha in the 'earth touching ' pose. elegantly brocaded in deep purple silk, Tamang style from Nepal. This quiet, but exquisite depiction, lends a peaceful serenity to a meditation or healing space. Email for pricing. Genuine antique ritual dagger from Nepal. The dagger represents the three worlds, three times and three emotional states (happy, somber and sad). Found in different forms and iconographic representations, they are used in healing, grounding, protection and creating harmony. Another example of the tool of the mundum, the world of the Himalayan shaman. 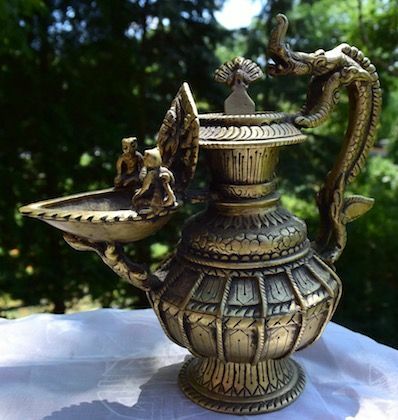 Fine antique Phurba from Nepal. The Phurba is the 'axis mundi' for the Himalayan shamanic groups, where in Buddhism the 'dagger' is viewed as the 'soul hero' or a 'stake' to pin down energy (used in weather control and many other rituals), the Nepalese shaman puts these to use in 'cintas', healing rituals; or to 'pick' the illness out of someone's body. Email for pricing. A beautiful example of Newari craftmanship. You will find lamps like this on altars in houses, or used in nightly 'Aarti' prayers around a home. Ganesh is the defender and remover of obstacles; as well as the god of wisdom and success. A Son of Lord Shiva and Parvati, he is also viewed as the Lord of New Beginnings. Among the shamanic groups in Nepal, he is seen as the 'first shaman.' Email for pricing. Machig Labdrön was a renowned 11th-century Tibetan tantric Buddhist practitioner, teacher and yogini who originated several Tibetan lineages of the Vajrayana practice of Chöd (cutting off of ego). 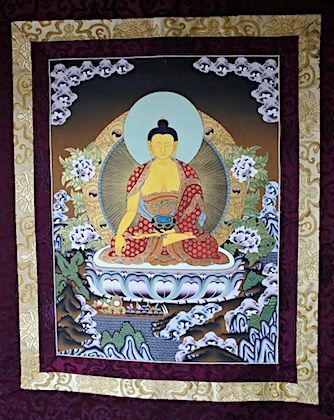 This thangka is unbrocaded, and would require framing which should have a red matte border in gold frame (traditonal). 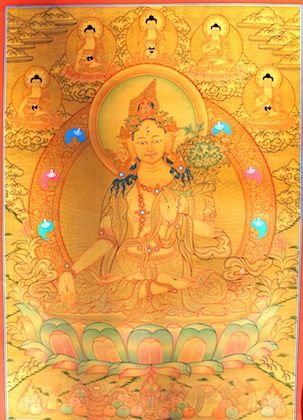 Chöd is the main practice of Tibetan nuns, and in some circles Machig Labron is seen as an emanation of Tara. She sets the intention of putting others first, which would be a consideration for women who perform healing's on others in their space; and that the presence of ego is removed. In this depiction she is surrounded by Protectors and Chöd practitioners. Genuine antique ritual dagger from Nepal. The dagger represents the three worlds, three times and three emotional states (happy, somber and sad). Found in different forms and iconographic representations, they are used in healing, grounding, protection and creating harmony. The Phurba is the 'axis mundi' for the Himalayan shamanic groups, where in Buddhism the 'dagger' is viewed as the 'soul hero' or a 'stake' to pin down energy (used in weather control and many other rituals), the Nepalese shaman puts these to use in 'cintas', healing rituals; or to 'pick' the illness out of someone's body. Email for pricing. A great place to store ritual pieces, altar items, or anything else for that matter. 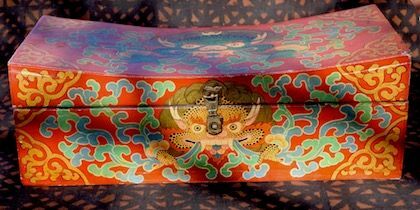 Highly decorated, hand painted, solid wood, 19.5 inches wide, 7 inches high, and 8.75 inches wide, made in Nepal. Garuda is found all throughout Asia, and even an airline is named after the mythological bird. Also known as Chepu, Khyung, and Kirtimuka depending upon culture and tradition. Seen as a protection motif and guardian. Lama thrones for example will have a Garuda painted on the seat or a carpet with Garuda on it will serve as a seat cushion. Garuda served as the mount for Vishnu, known as the King of Birds and destroyer of serpents and snakes. In Buddhist circles Garuda is the protector and destroyer of Nagas. Many stories circulate about Garuda, but it's origins appear to be in the Mahabharata, the epic story in Hinduism in which the Bhagavad Gita originates. This piece came out of a collection, seldom used, but shows a little wear. Email for pricing. 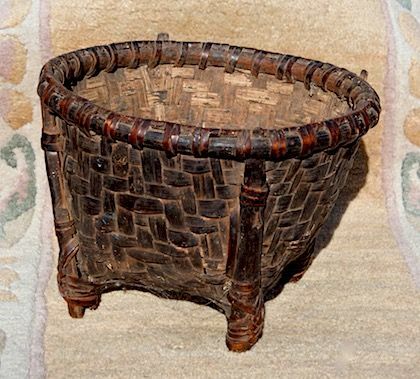 The basket is a traveling altar used by the shamanic groups in Nepal. Filled with rice, the shaman places his 'power objects' onto the rice filled basket. Depending upon tradition, there are dozens of objects that are placed within. Usually always a small statue of Ganesh (represents the first shaman), garnet, sacred herbs, mustard seed, phurbas, and assorted 'tools.' The basket is cleaned prior to filling it with rice by rubbing mugwart (titepati) all around inside to cleanse the altar. 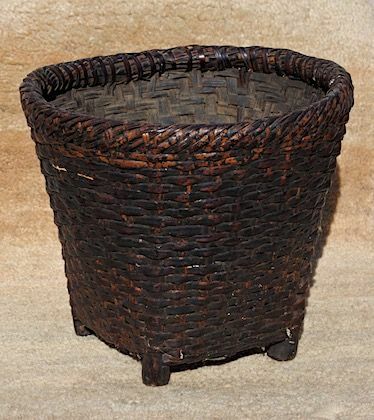 These genuine baskets are very hard to locate, we obtain ours from a Tamang family who assists anthropologists in their field studies in Nepal. 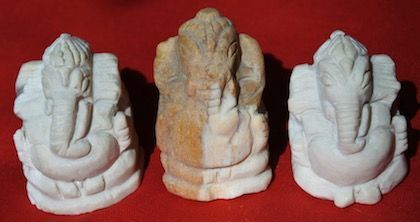 These a very small Ganesh statues about 1.25 inches high and an inch wide. One of our scouts visiting Thailand found these years ago, and we just discovered them now going through one of collection boxes. Perfect for a Nanglo, small home altar, or in your healing space. Ganesh, Ganesha or Ganapati is one of the most important gods in Hindu mythology and he is also worshipped in Jainism and Buddhism. For the Ganapatya Hindu sect, Ganesha is the most important deity. Ganesha is highly recognizable with his elephant head and human body, representing the soul (atman) and the physical (maya) respectively. He is also the patron of writers, travelers, students, commerce, and new projects (for which he removes obstacles from one's path). Email for pricing. These handcarved candle holders would be perfect on a home altar or in a healing space. Their acquisition is a interesting story. They are part of a collection of pieces from one of our Field Researchers, who never used them, and stored them in her library. They were a gift given to her by a Tibetan Lama Astrologer from Dehra Dun, India, at a time when Sandalwood was not scarce and controlled. 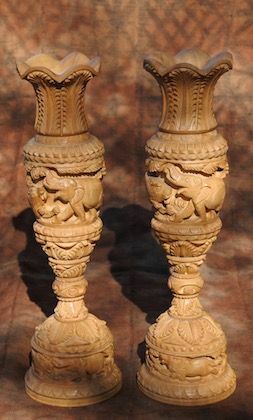 Decorated with elephants and lions, 12 inches high, 3.5 inches at the base. Email for pricing.